Union Printed, Cooling Towel with Case, Microfiber Suede Towel Keeps You Cool in the Heat, While Walking, Running, Golfing, Gardening or at Your Gym Workouts & other Sporting Activities. make constantly freezing watery ice packs a thing of the past, our ultra convenient Cooling Towel requires no refrigeration, instead it activates when you simply soak it in Water, wring out and snap it! comes with case to store and carry towel anywhere. 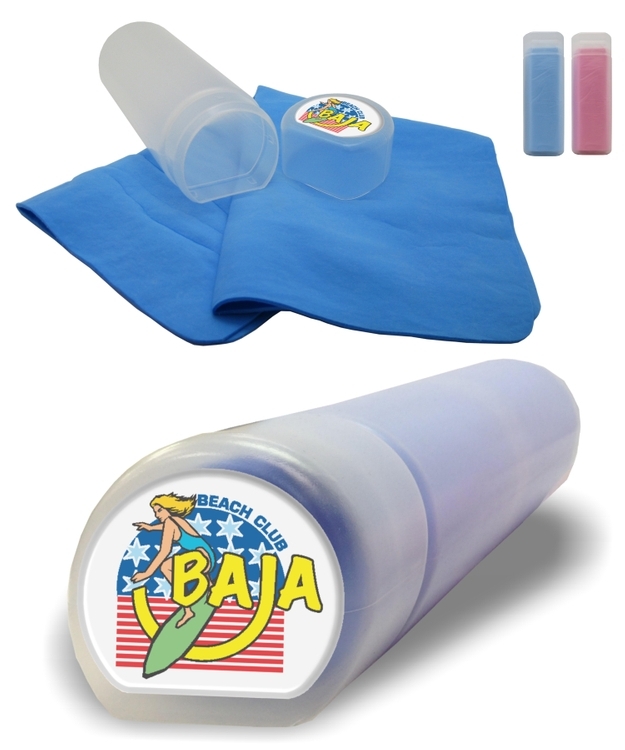 Durable, reusable and machine washable to ensure that your cooling towel will be with you all summer long. Full Color Process Epoxy Dome Label Print Included - NO MINIMUM. Decorated in our Union Shop - Union Bug Available at No Charge! • Imprint Area: 2" x 1.75"